Another border forced to bend to the will of a steadfast woman. 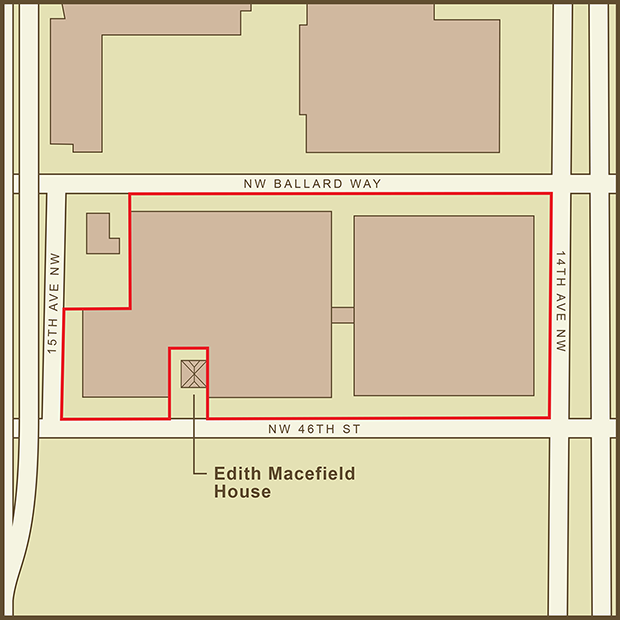 In 2006, a developer in the Ballard neighborhood of Seattle wanted to build a five-story shopping mall on the same block as Edith Macefield’s house. The had already purchased the rest of the land they needed and had offered Edith $750,000 for her house when it was assessed at a value of just $210,000. Edith said no. She had seen enough change in her life and formerly blue-collar neighborhood and was not moving. She dug in for the ride. The developer raised the offer to $1 million but she wouldn’t budge. So they built the mall around her. Edith passed away of pancreatic cancer in 2008 but she lived in her house till the day she died, as was her wish. The house is still there and has become a monument to her strength. A local tattoo artist has created a tattoo with an illustration of the house and the word “steadfast”. She is one of a number of famous holdouts who’s legacy remains etched in property lines long after the battle is fought. The story has a very touching twist relating to the relationship between Edith and the shopping mall’s construction superintendent. The entire story is the subject of an interesting podcast on 99% Invisible and how I discovered the border in the first place. Sometimes strange borders hide in plain sight. According to Wikipedia, there are ten US states with panhandles. Florida, Alaska and Oklahoma are probably the most obvious examples. Every panhandle has a story but none that were defined almost entirely by the fight over slavery. “When… Texas entered the Union in 1845, it wanted to maintain slavery, which it had permitted during its days as an independent republic. Under the Missouri Compromise (1820), however, Texas could not be a slave state if it’s borders extended north of 36º 30'. So Texas lopped off its lands north of 36º 30' and gave them to the United States. In doing so, Texas created what would later become the southern border of the Oklahoma Panhandle. The Kansas-Nebraska Act was passed in 1854, and repealed the Missouri Compromise. It was passed to open up the western territories to settlement but left the issue of slavery open to the settlers of those territories. It also set one of the borders of these settlements at 37 degrees and in the process also set the northern border of what would be come Oklahoma." Several of the borders I’ve documented have become tourist attractions even though there was no foresight that this would happen when they were created. The Hotel Arbez and the border it harbors under its roof is the opposite. In 1862, France and Switzerland reached a deal to swap some land and adjust the border agreed to in a previous treaty. The new treaty would split the existing town of La Cure and some of its buildings between the two countries. Knowing this, the two countries stipulated that any buildings that lay across the border at the time of signing could remain in place. A local business man named Ponthus realized this would apply to new buildings as well and set about his plan. He quickly built a 3-story building on his land that straddled the new border and then opened a grocery on the Swiss side and a bar on the French side. He seemed more interested in running two separate businesses than in a single “international” business. The building was later sold to the Arbeze family who turned it into the Hotel Arbez that has remained open to this day. 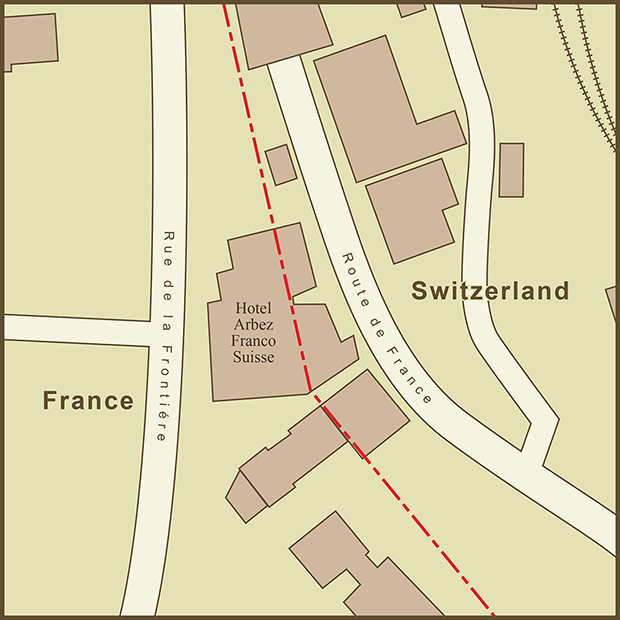 Switzerland’s neutrality in World War II created a unique situation inside the building for the Germans in occupied France. They could enter the building from France but could not venture into the Swiss side. The staircase to the second floor started in France but ended in Switzerland. This effectively made the upper floors inaccessible to the Germans and made them something of a refuge for members of the French Resistance. The Hotel has embraced their unique situation to this day. In an ironic, if not cynical, move, the bed of the Honeymoon Suite is located so that half the bed is in Switzerland and half in France. One could make a joke about international relations but I’ll refrain. Historically speaking, rivers make great borders. After oceans, few natural features are better at defining “us" and “them" than rivers. Rivers could be dangerous and hard to cross. They made great reference points for treaties. There’s just one problem with all of this. Rivers change course faster than treaties do. Such is the case with the path of the Danube as it winds its way between what is now Croatia and Serbia. I’ve written about this issue before. The Mississippi river defines and divides multiple states as it runs it course from Minnesota to Louisiana. State borders have stayed fixed as the river has changed course dramatically. What makes this example unique is the nature of the claims to this stretch of land by Serbia, Croatia and a certain libertarian-minded man named, Vit Jedlicka. The Danube had been the accepted border between the two regions that would be come Croatia and Serbia. As a border, it was great but as a navigable river for transport, not so much. So the river was straightened and, as a recent article in the New York Times put it, "The straightened Danube was a vast improvement for international riverine transport, but in the process, four large uncontiguous bulges of Croatia became stranded alone on the Serbian side, and one small pocket of Serbia, on what was now the far bank, became attached to the Croatian mass." The obvious imbalance of territory is what makes the story so interesting. The four large bulges are of obvious interest to Serbia. They are now on Serbia’s side of the river. Accordingly, they have staked their claim to them. The natural response would be for Croatia to claim the formerly Serbian land on their side of the river as their own. But to do so would also legitimize what Serbia did and the result would be massive land gain for Serbia. So Croatia has taken the tactic that the historic border should remain intact. Their claim has the side effect that neither country claims the small area of land on the Coratian-side of the river. This puts the parcel in question into a situation known as "terra nulls”. Land that remains unclaimed by any state. Except now there is a new twist. Nature and men both seem to abhor a vacuum. Upon learning about the unclaimed land, Vit Jedlicka, a Czech politician with statehood aspirations, decided to pounce. The man and his plan make for a great story that is better told by the New York Times. The Bir Tawil Triangle is likely the only unclaimed territory in the world. It is the result of a territorial dispute between Egypt and Sudan over the nearby Hala'ib Triangle. The original 1899 border between the two countries followed a straight line along the 22 degrees North latitude line. However the British drew up a new administrative border in 1902 that strays from the original border in several spots. The revised border gave an Egyptian tribe access to a well and grazing lands at Bir Tawil (Bir Tawil means water well). It also gave Sudan administrative control over the area marked Hala'ib Triangle because the dominant tribes in the region were Sudanese in origin. Today, both countries lay claim to the Hala'ib Triangle since it is a large territory and borders the Red Sea. The problem comes from the intersection of the two borders at the Bir Tawil Triangle (actually a trapezoid). By claiming the original 1899 border to get Hala'ib, Egypt makes no claim on Bir Tawil which lies south of this border. Sudan pursues Hala'ib by claiming the 1902 border which leaves Bir Tawil as Egyptian territory. So in their pursuit of larger gains, each country makes no claim on the secondary territory. No other country can claim it as it is landlocked between Egypt and Sudan. There was a third territory adjusted in the 1902 adjustment called the Wadi Halfa Salient. That adjustment was made to assign several villages to Sudan who were better able to manage them from the South. Although the border remains, there is no territorial interest here as the villages now lie under the waters of the (manmade) Lake Nassar. I stumbled on this stretch of the Mississippi River while I was working on the Mississippi River TypeMap. I noticed that the state border was meandering as much as the river itself but not always in sync with it. As is common with many rivers, the river has changed course since the the state borders were set. I wonder what it is like for those living along the river in these spots. The Mississippi is such a prominent and natural boundary that most residents must regard it as their state border. In "The Omnivore's Dilemma", Michael Palin interviews a mushroom forager about the mysteries of how mushrooms grow. The forager summarized the mystery as, "why here and not there and why now and not then?". I was reminded on this quote while I was making the map. There are multiple remnants of the river's past course... why weren't they used to mark the border. The answer is that the borders as marked followed the centerline of the Mississippi River at the time that the state borders were drawn. Given that the river is such a strong boundary, it would seem natural to have the border remain in the center of the river even as the river changes course. But that is not in the nature of how borders are drawn. Ink is clearly more permanent than water. The Diomede Islands lie in the middle of the Bering Strait between Russia and the United States. Though the two islands are only about 2.4 miles apart and clearly a single group, they are separated by the International Dateline which also marks the international border between Russia and the United States. Big Diomede is owned by Russia and Little Diomede is owned by the USA. They are sometimes called Tomorrow and Yesterday respectively because they straddle the dateline. "The western limit within which the territories and dominion conveyed, are contained, passes through a point in Behring's straits on the parallel of sixty-five degrees thirty minutes north latitude, at its intersection by the meridian which passes midway between the islands of Krusenstern, or Ignalook, and the island of Ratmanoff, or Noonarbook, and proceeds north, without limitation, into the same Frozen Ocean." The treaty references Krusenstern and Nunarbuk which were alternative Russian names for the islands as well as names used but the local native population. There is a small Inupiat Eskimo population on Little Diomede Island in a small village on its Western shore. Big Diomede has a small Russian Military population but the native population on Big Diomede was relocated to the mainland by Russia. The islands gained a bit of unexpected fame during the 2008 US Presidential Election. Although you really can see Russia from Alaska here, it became the subject of a Saturday Night Live satire with Tina Fey playing the role of Sarah Palin in her less than successful bid for the Vice President. I expect this map to change over the next few days as it is the best representation I could make after reading many stories and reviewing a bunch of maps on the Internet. Uganda and Kenya have been arguing over who owns the small island, barely visible at the center of the map above. The dispute has been brewing over the last few years and has finally led to a joint survey that is being conducted this week by both countries with results expected as soon as this week (May 15th). As far as I can tell, the dispute comes down to whether the islands are East or West of the Western tip of Pyramid Island just to the South. Pyramid Island is referenced in the constitutions of both countries. From the Western shore of Pyramid Island, the border line continues North to another island. If the shores of Migingo Island are West of that line then the island is in Uganda, otherwise, they are in Kenya. I have drawn the islands as being just barely in Kenya as the most recent press and other descriptions seem to be leaning towards a situation where the island is in Kenya but the water just West of the Island is in Uganda. This would be ironic because the source of the dispute is fishing rights over the dwindling Nile Perch that are still in abundance around the island. The island was uninhabited until at least 1991 when two Kenyan fisherman say they set up residence. Uganda says that a Ugandan fisherman started living on the island in 2004 and had found the island abandoned. The island is about half the size of a football field and barely above water. It may have even been below water in previous years when the waters of Lake Victoria were higher. It is amazing to see the island itself because it is basically a large rock with a bunch of tin hacks that house the islands 1000 or so residents. There is barely any open space on the island. I plan to update the map once the surveyors complete theirs. Apologies in advance for any inaccuracies but I wanted to get the story out while it is still unfolding. Order a few drinks at Restaurant Kalin in Slovenia and you are likely to end up needing to cross the border to go to the bathroom. That's because Restaurant Kalin lies directly on the border between Croatia and Slovenia. The tables lie in one country, the bathroom in the other. The restaurant has painted a yellow line down the middle of the restaurant to mark the border. The border originally followed a wandering stream. There are many historians and economists who say that the battles of the future will be fought over water not oil. Though only a battle of words, one is already occurring between Georgia and Tennessee. The original border between the two states was supposed to be drawn along the 35th Parallel. The actual border that was staked out was about a mile south of the where it was supposed to be. Stories differ as to why this happened. One postulates that the line where the border should have been drawn was difficult terrain so the survey crew marked the line on more navigable land. I love stories of human error so this is the story I want to believe but this can't be the first time a crew had to mark a line across challenging terrain. The other theory attributes the mistake to a simple matter of instrument accuracy. Whatever the case, the border was staked out and a map was drawn with the border more or less where it lies today. The error was eventually caught but by then the wrong border had been around long enough that it had become the accepted state line. The border issue is being raised now because Georgia has a water shortage. If the border had been drawn accurately, a small part of the Tennessee River would lie inside Georgia, giving it access to much more water than it has today. Atlanta is sometimes called, "The Las Vegas of the American Southeast" for its habit of living beyond its means when it comes to water. Georgia politicians have made numerous attempts to resolve the border issue with Tennessee ("in the 1890s, 1905, 1915, 1922, 1941, 1947, 1971" and 2008 according to one source). But such a change would require approval from Congress and Tennessee... something that's unlikely to happen. Moving the border would solve Georgia's problems but would create new ones. A Washington Post article reported on two issues that Georgia does not seem to bring up in its proposal, "Not only would Georgia get a chunk of Chattanooga, but Mississippi would get a slice of Memphis." Perhaps the best quote on the border issue came from a contemporary Georgia surveyor, Bart Crattle who said, "It's correct -- no matter how wrong it is." Only the discovery of fossil fuels would make two countries argue over what had previously been described as "terra nullius" (vacant territory), and "barron rocks". The Senkaku Islands are made up of 8 land masses... five uninhabited islets and three rocks. What lies underneath is what makes them suddenly so interesting. The islands lie 120 nautical miles west of Okinawa and North East of Taiwan. The dispute is primarily between Japan and China but China needs the proximity and history of Taiwan to bolster it's claim so Taiwan is part of the dispute by proxy. The earliest recorded reference to the Islands seems to come from China. There is even a Japanese map that shows the islands as Chinese territory. Japan claims the islands as spoils from the 1895 Treaty of Shimonoseky it signed with China after the First Sino-Japanese War. China's claims originate from the Treaty of San Francisco which was signed by Japan and the Allies after World War II and rendered the Treaty of Shimonoseky null and void. After WWII, the United States administered the Senkaku Islands until 1972 when it handed administrative control over to Japan along with Okinawa. China's (and Taiwan's) renewed interest in the islands started in 1970 (coincidentally just two years after the potential for oil was discovered). The dispute continues and the islands have had a regular presence in the news as an Asian flashpoint. The United Nation's "Law of the Sea" gives nations control over a 200 nautical mile "exclusive economic zone" (EEZ) surrounding their territory. EEZ's include seabed and submarine resources like oil and natural gas. The border in the lower right and encompassing everything above it on the map is China's EEZ claim and extends out from Taiwan's border to the south-west. The border in the top left is Japan's EEZ claim and extends out from the (undisputed) islands in its Okinawa prefecture. Not willing to wait till the matter is formally resolved, China built a natural gas drilling platform outside of Japan's claimed territory but which is capable of drilling into the disputed area to extract gas. Skirmishes and posturing continue including altercations between Chinese, Taiwanese and Japanese ships circling the islands to assert their claims. Although Senkaku is the Japanese name for the group of islands, China refers to them as the Diaoyo Islands. Diaoyu and the Japanese name for Uotsuri, the largest island translate as, "Fishing". It's strange that the island being disputed is called, Brazilian Island as the name makes it sound like there's no dispute at all. Information on the roots of the dispute are scarce. The island is at the confluence of the Quarai, Cuareim, and Invernada rivers. The rivers form a tripoint border with Argentina but the Argentinian border is not under dispute. In an essay titled, "Islands in Between", Godfrey Baldacchino offers the following observation, "We should not be surprised: borders, in spite of conventional wisdom and official intent, are often porous, permeable features: they are liminal spaces with osmotic properties, important tools in a contemporary game of economic prosperity, military strategy or national security. Even here, islands ‘in between’can play a key role." The same article quotes the Former Prime Minister of Trinidad and Tobago as saying that his country operates in a state of "betweenity" having been claimed by more than one nation. I like that word. It would have been a good way to describe my career on more than one occasion. Hans Island lies smack in the middle of the Kennedy Channel section of Nares Strait. This places it on the border between Canada's Ellesmere Island and the Kingdom of Denmark's Greenland Territory. In 1973, a treaty between the two nations plotted 127 points delimiting the agreed upon border. Although the treaty did not connect the dots, points 122 and 123 go right down the center of the island when connected. Hans Island appears to be of little strategic or commercial interest but this has never stopped nations from starting a tug of war over sovereignty. Luckily, even though there are real emotions, the actions seem to be light hearted, if not satirical. In 1984, Denmark's Minister of Greenland planted a Danish Flag on the island along with a bottle of cognac. Canada responded with newspaper headlines announcing, "Canada being invaded" and "Denmark massing troops on Canadian Territory"
Google War - In 2005, a "Google War" was started with individuals from both countries placing ads on Google declaring Hans Island as Canadian or Danish territory. The ads are no longer live but a Google search today turned up links for, "The Hans Island Liberation Front", "Hands off Hans Island", "Radio Free Hans Island", and the "Free Hans Island from Canadian Oppression" website. The last link is a fun read. It's nice to see a lingering border dispute happen with a sense of humor. 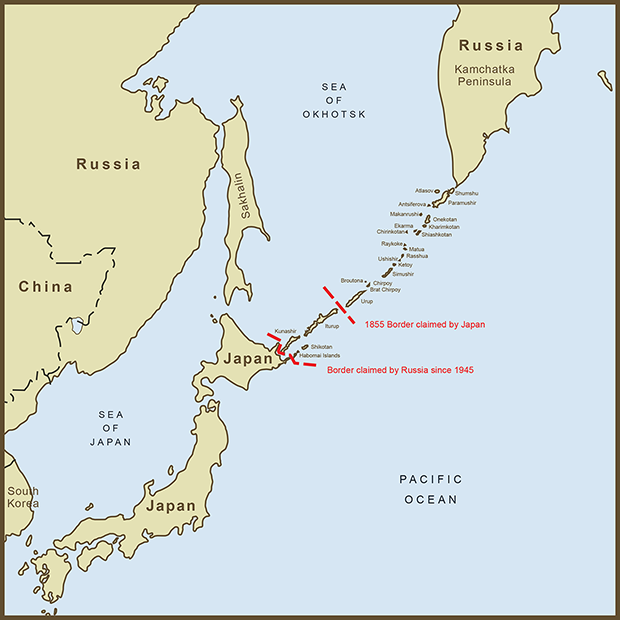 The dispute between Japan and Russia is over the southern-most islands in the Kuril Island chain, specifically Iturup, Kunashir, and Shikotan Islands, and the Habomai Rocks. The current dispute dates from the aftermath of WWII when the Allies dictated terms to Germany and Japan. Treaties that reference ownership of the islands include the Yalta Agreement, The San Francisco Treaty, the Potsdam Declaration, and the Treaty of Portsmouth. None of these treaties however seem capable of resolving the dispute. They either fail to describe the specific border, which islands are included or, as is the case with the San Francisco Treaty, the treaty was not signed by both Russia and Japan. The San Francisco Treaty is also the source of the dispute over nearby Sakhalin Island. Reading snippets from some of these treaties and seeing all the problems they cause makes me think I could be a treaty writer. Though not a new dispute, the Kuril Islands were in the news again on November 1st, 2010 when Russian President Medvedev visited Kunashir Island, the island closest to Japan's undisputed island of Hokkaido. The video I saw on CNN of Medvedev taking pictures of the coastline made him look more like a tourist than a global leader throwing salt in Japan's eyes. The message to Japan was quite clear. Since Japan is an island nation, The Kuril Islands seem like a natural continuation of its other, undisputed islands. Of course Russia might say that they are the continuation of the Kamchatka Peninsula. Japan is not asking for all of them... only 3 plus some rocks. And since Japan is small and Russia is so big, the part of me that cheers for the underdog wants to say, "come on Russia, show some love." There is no dispute over this one, it's just your garden variety error. It stems from a bad map and a negotiated treaty between England and the United States. 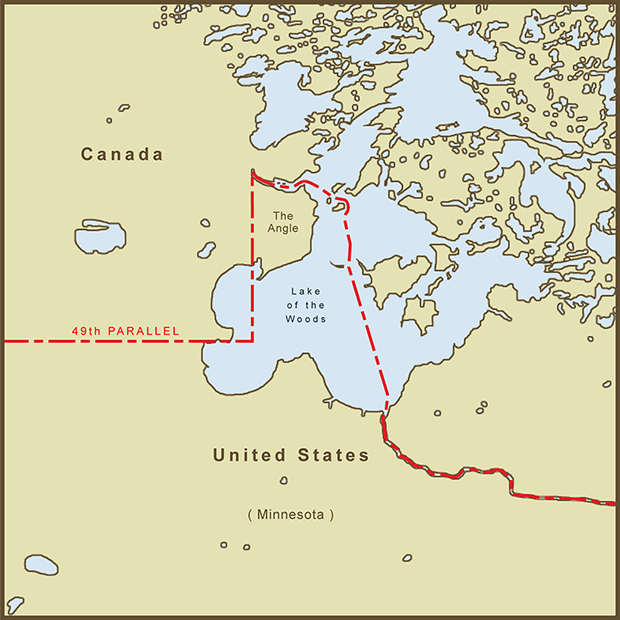 the fact that it is the only section of the Continental U.S. Border that extends above the 49th parallel, the latitude that marks the majority of the US border with Canada. Even Maine, which optically appears further North on some projections remains south of the 49th Parallel. it creates a situation where driving from one spot in the Minnesota to another spot in Minnesota requires a 63 mile drive into Canada and then back into the U.S. even though the two spots are just 18 miles apart as the crow flies. It is one of only four places in the continental U.S. where a section of a state (other than an island) is disconnected from the rest of the state. According to the Wikepedia entry,"The Treaty of Paris, concluded between the United States and Great Britain at the end of the American Revolutionary War, stated that the boundary between U.S. territory and the British possessions to the north would run "...through the Lake of the Woods to the northwestern most point thereof, and from thence on a due west course to the river Mississippi..."
That all sounds pretty simple and clear as far as border descriptions go. The only problem was that the line could extend West all the way to the Pacific Ocean and never run into the Mississippi River. The source of the Mississippi, Lake Itaska lies almost 150 miles south of where it was expected to be. The error started with the Mitchell Map, a map that was in widespread use at the time. When the problem was corrected by the Anglo-American Convention of 1818 it created a chunk of land that is part of Minnesota but cut off from the rest of the state. That land is called, The Northwest Angle, or simply, "The Angle" by locals. It is sparsely populated and most of the land is under the stewardship of a local Indian tribe. The immigration and customs office for The Angle is actually a phone booth with a video phone in it. How did I not hear about this border sooner. An island less than 1200 feet long with a border that takes more twists and turns than a Stieg Larsson novel. It is now possible to walk the length of this short island and cross an international border three times. However, despite the strangeness of the border, Sweden and Finland have always agreed on shared ownership of the skerry (a Norse word for rock in the sea) and the serpentine border results from an effort to correct Finland's accidental siting of the island's lighthouse on the Swedish side of the border. The island is otherwise a textbook example of international cooperation and agreement. Market Island or Reef (Market Fyr in Swedish) is part of the larger Aland Island chain that lies between Sweden and Finland. According to Wikipedia, ownership of the islands has been shared ever since the Treaty of Fredrikshamn in 1809. Prior to the building of the lighthouse, the border between the two countries passed down the middle of the skerry so that half the island's land mass was in Sweden and half was in Finland. When it was discovered that Finland had accidentally built the lighthouse on Sweden's half of the island, a fix was necessary. 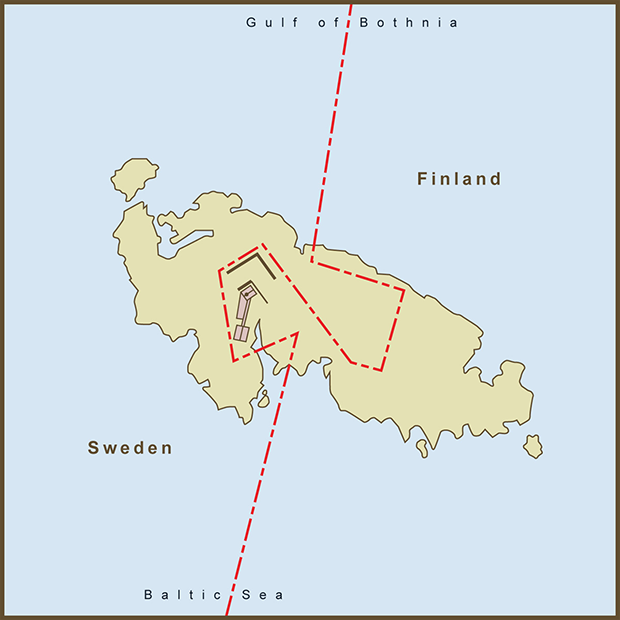 The resulting zig-zag border allows the lighthouse to be in Finland while retaining the 50/50 split in land area and avoids any changes to the maritime border. Any alterations of that would have resulted in a change in fishing rights… Perhaps the one thing that might have caused strife between the two herring-loving nations. Phew. The border of Kentucky at what is known as "The New Madrid Bend" owes it's strangeness to the serpentine path of the Mississippi River. The River was supposed to define the western edge of the state of Kentucky and the Southern edge of Missouri. The result is an exclave peninsula of land in Kentucky that is completely surrounded by Missouri and Tennessee. To drive here from the rest of Kentucky, you must leave the state, drive through Tennessee and come back into Kentucky. This spot along the Mississippi River is also the site of several historic events. Most notable is the "Battle of Island Ten" in the Civil War where Confederate Troops occupied Island Ten (now mostly part of the shoreline at the southern-most part of the bend in the map). The plan was to block and defeat the Union Troops coming down the Mississippi from the North at a slow point in the river. The plan didn't work so well. Although this was a potentially vulnerable spot in the river, Island Ten was also remote and could only be re-supplied by a single road through swamp and marsh land (the Union eventually succeeded in cutting off Confederate supply lines). Mark Twain wrote about the area in his book, "Life on the Mississippi" and in particular about the feud between the Darnell and Watson families. One family was from Kentucky, the other from Tennessee. According to Twain, the two families attended the same church at what is/was known as Compromise Landing. The Church straddled the border between Kentucky and Tennessee enabling the families to walk up the aisle on their side of the church and attend services without stepping into the other state. Lastly, New Madrid was the epicenter for several of the strongest Earthquakes ever felt in the United States in 1811 and 1812. According to Wikipedia, the earthquakes were so disruptive that they reportedly reversed the course of the Mississippi River around the area. Sometimes called, "The Horseshoe", the 4th Congressional District of Illinois is considered one of the worst examples of gerrymandering in current US political geography. The district includes two separate East-West sub-districts, one largely Puerto Rican the other Mexican in population. In order for it to be considered a single district, all areas must be connected. For District 4, this is done via a thin strip of land along Highway 294. There is no population contained in this strip so it serves solely as a connector. This lack of focus on the population being represented means that voters are disenfranchised which can reduce voter turnout. Numerous attempts have been made to reverse gerrymandering but the problem persists. Because gerrymandering often favors both parties (albeit in separate districts) there is little chance of re-districting bills getting the necessary support to pass. California finally passed a state-wide proposition to (attempt to) fix the problem in 2008. The new maps were approved by citizens in a separate proposition in the November 2012 election. Note: the above map was made in May 2011 but is generally consistent with how the district looked for the November 2012 elections. Such a fall from grace. According to Wikipedia, Maryland's District 3 is one of only 50 districts to have elected a representative to the first United States Congress. That was in 1789. In 2012, the district was found to be the "third least compact congressional district in the United States" according to the Maryland Reporter. The current district boundaries are actually an improvement over its 2011 borders (which you can view at the Maryland Reporter link below). Yet another example of gerrymandering, this one favors Democrats. Despite the fact that the district surrounds and includes parts of Baltimore, the district is over 75% white. The City of Baltimore, in contrast, is 64% Black (as of 2010 census). Gerrymandering is one of the root causes for the disfunction we see in Congress. Gerrymandered districts tend to vote solidly for one party, either Democrat or Republican. This encourages candidates in these districts to be more extreme in their views to speak to their base. Districts that are politically diverse require a more moderate tone in order to appeal to more voters. I had been keeping an eye out for another gerrymandered election district to include in this series after my map of Illinois District 4 started getting tons of views on Flickr (over 163,300 as I write this). I realized that part of the reason I've been avoiding maps of gerrymandered districts is that they look so illogical and messy. They don't make for great maps. I did not enjoy tracing the haphazard lines of the Illinois map and I certainly didn't enjoy drawing this one. But the pain of drawing it is yet another sign in my mind of how bad they are. Bad for cartographers, bad for democracy. Gorizia is a town in the north eastern corner of Italy in the foothills of the Alps. The town lies on the border with Slovenia. The current border was set in 1947 as part of a Peace Treaty signed after World War II. Since then, as the city has grown it has affectively grown in two different countries... Gorizia on the Italian side and, on the Slovenian side, the twin city of Nova Gorica (New Gorizia). The border between the two countries effectively divides the city and runs right down the middle of the public square that lies in front of the town's railroad station. Although the border remains where it has been since 1947, on December 21st, 2007, Slovenia joined the "Shengen Area", a group of 25 European nations that agreed to allow free passage across all borders to member citizens. Shengen Area nations are also now part of the European Union. 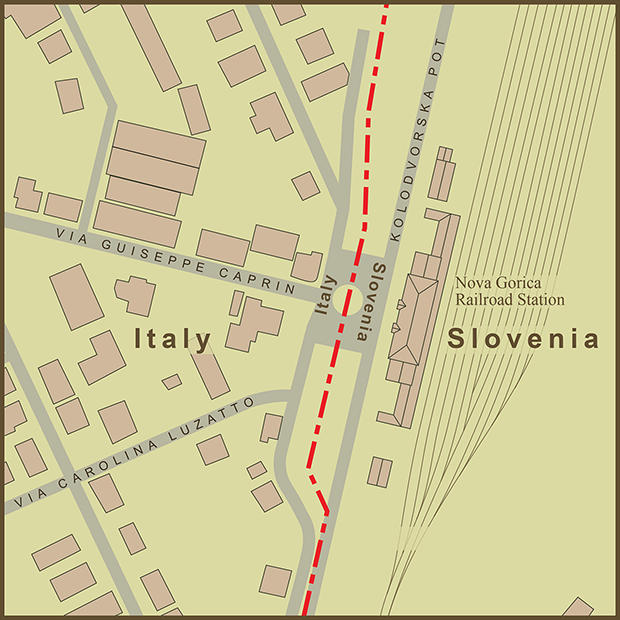 This vastly eased movement between Italy and Slovenia... including where the border passes through the town of Gorizia. Still, boarding a train in Gorizia, Italy means a walk down Via Guiseppe Caprin, and crossing in Slovenia as you cross the public square in front of the train station. A crossing that not too long ago was considered illegal.